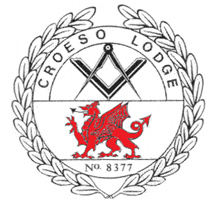 Croeso WM W.Bro Gareth Burgess is part owner of Avi8tors Flying Club in Cardiff. 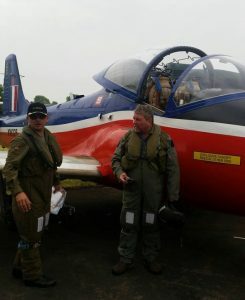 When he offered Croeso Members the chance to fly with him in a military jet our brave Senior Warden, Bro Jeff Mears, was the first to volunteer for the experience of a lifetime. A date was set and Bro Jeff prepared himself thoroughly for the event by watching Top Gun on DVD the evening before the flight. 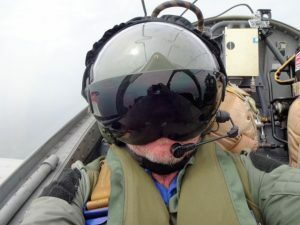 After a safety briefing which included instructions on the use of the ejector seat, radio and oxygen systems, Bro Jeff donned his bone-dome and strapped himself into the cockpit. Captain Burgess took the two seater Jet into the air accelerating to over 400 mph. 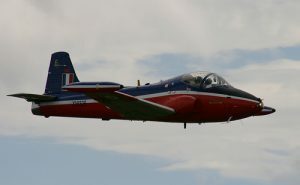 He flew at low level from St Athan Military Airfield along the South Wales coast towards Ogmore by Sea. 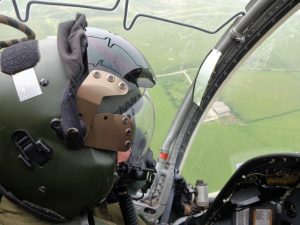 The 45 minute sortie included an exhilarating high speed, high G flight along the coastline before returning for a 250 mph fly-by 50 feet above the runway followed by a tactical running break manoeuvre to land back at St Athan. Bro Jeff said after the flight that he would recommend the experience to anyone and was proud of the fact that he managed to hold on to his breakfast throughout the whole trip.